On 03-May-2015, AIPMT-2015 was conducted for entrance into state and national level medical colleges for MBBS, BDS, BAMS, BHS courses. This is the second edition of this exam after changes were introduced in year 2014 by CBSE and Ministry of HRD. Around 6 Lakh students appeared for this exam. Some states/ UTs have fully opted for AIPMT – 2015 and will fill 100% of Govt. Medical & Dental seats on the basis of AIPMT – 2015 and these states are Haryana, Himachal Pradesh, Madhya Pradesh, Andaman & Nicobar Islands, Arunachal Pradesh, Manipur, Meghalaya, Odisha, Rajasthan, and Chandigarh. States those who have not opted fully for AIPMT – 2015 will fill up their 15% of Govt. Medical & Dental seats on the basis of AIPMT – 2015 and rest 85% seats on the basis of their own State Level Medical Entrance Exam. 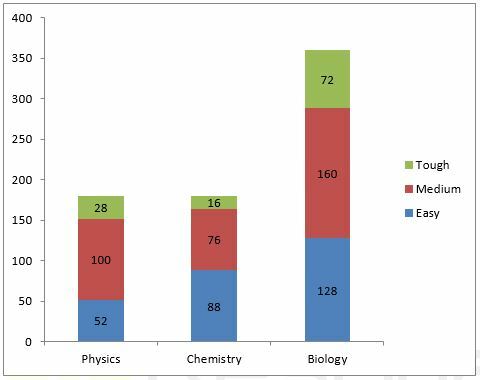 AIPMT – 2015 was conducted in one paper consisting of 45 questions each from Physics and Chemistry, and 90 questions from Biology which consists of Zoology and Botany subjects. Exam was conducted on 3rd May 2015 from 10:00 am to 01:00 pm. Given below is the subject wise detailed analysis of AIPMT-2015 question paper. # The Cut-off of AIPMT – 2015 is estimated on the basis of Previous Year Data and Toughness Analysis of AIPMT – 2015 Paper by Resonance Experts. These are not official data released by Authorities concerned. The paper pattern was same as last year with 180 questions each worth 4 marks. All questions were objective type with single correct option. If we talk about subject wise then there were 45 questions from Physics and Chemistry, and 90 questions were from Biology (Zoology and Botany combined). Resonance Experts feel that overall difficulty level was a bit higher than last year. Subject wise while Biology and Physics was on tougher side, while Chemistry was on easier side. While around 268 Marks can be considered easy overall, 336 marks were of moderate difficulty and 116 marks are considered difficult by Resonance Team. Overall, it is felt by Resonance Faculty Team that paper was on tougher side compared to last year and the cut-off is expected to be lower than that of last year. ← Resonance is Hiring !!! Thanks! It is very helpful.